Abudi Consulting Group Press Release: New Book Out! Implementing Positive Organizational Change is based on Gina Abudi’s years of experience working with organizations on managing change. In today’s increasingly competitive global marketplace, organizations that do not regularly undertake change initiatives will find it difficult—if not impossible—to continue to be successful in the long term. Most organizations only launch change initiatives when forced to address some pain, such as decreased revenues or profits, where the sole focus is on the benefits to the organization. 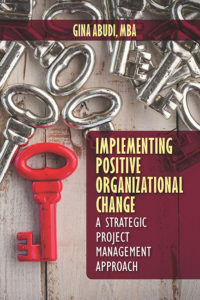 Implementing Positive Organizational Change explains how to develop a continuous improvement culture of change that will be perceived by employees as a positive opportunity to create something new, exciting and valuable, instead of something negative to confront and resist. This comprehensive guide describes how to communicate with and engage stakeholders and employees to gain buy-in and support, and outlines a strategic project management approach that helps ensure successful implementation and desired results. Abudi Consulting Group, LLC (ACG) has been in business since 2006. ACG focuses on providing services to medium to large and global organizations to assist them in improving efficiencies and effectiveness within their businesses, enabling shorter time-to-market for products and services and utilizing resources effectively and efficiently to meet business goals. This is done through implementing strategy around projects, processes, and people – key components of any organization. By spending time up front understanding clients’ needs, ACG ensures that they can assist the client in meeting their long-term strategic objectives – whether that is through providing strategic training programs and workshops or through consulting engagements. ACG’s goal is to ensure the client can pick up where ACG leaves off; continuing in-house the work done by ACG. Learn more about Abudi Consulting Group, LLC here: http://www.AbudiConsulting.com.